Main hall of the Church of the Nativity with its wood ceiling. The Armenian area of the church. 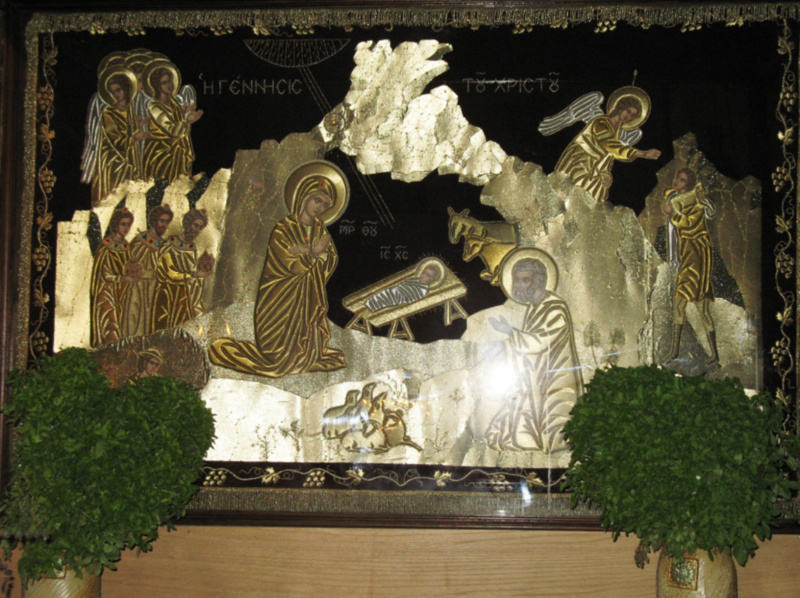 A golden tapestry hung inside the basilica. 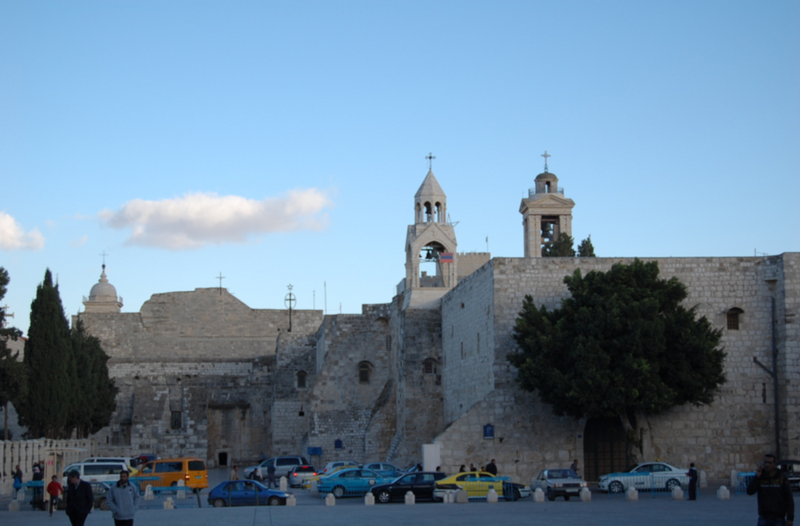 In the city of Bethlehem–the supposed birthplace of Jesus Christ–lies the Church of the Nativity. This basilica is a prominent religious location for many Christians: Greek Orthodox, Armenian Apostolic, Syriac Orthodox, and Roman Catholic. Construction began on the site’s original church in 327 A.D. and concluded in 333. 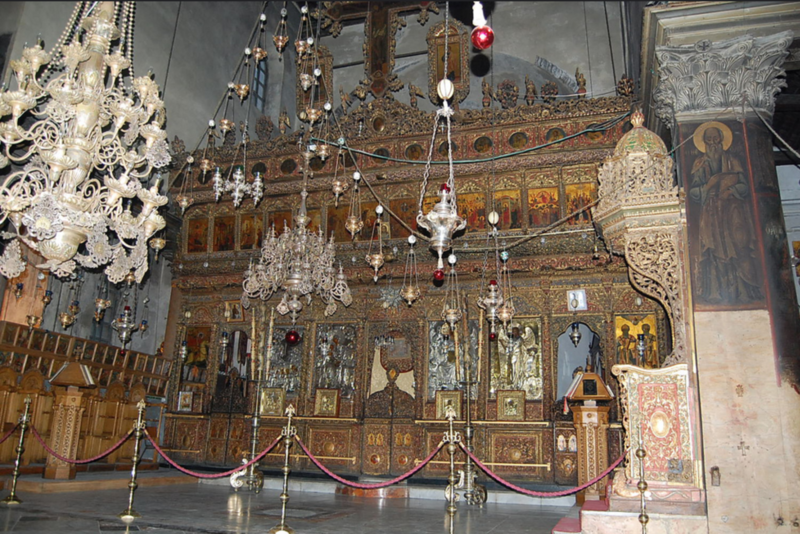 Around 530 A.D. the original church was destroyed in a revolt against the Byzantine emperor. Subsequently in 531, Emperor Justinian ordered the restoration of the city and construction began on the current church. 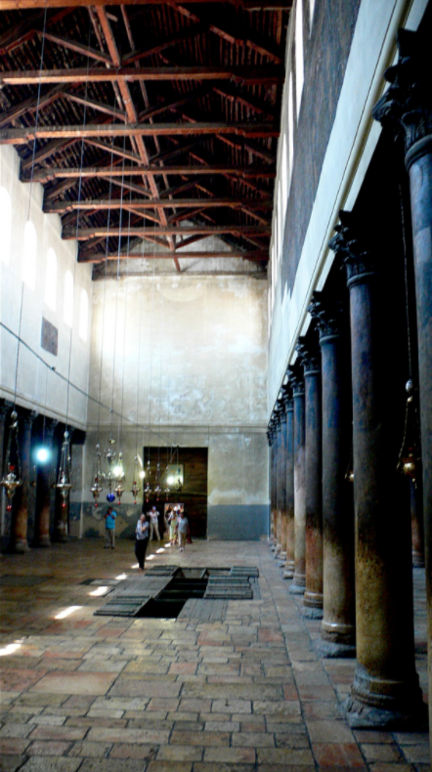 In 2012 UNESCO marked the site as “in danger,” and work has begun to restore the basilica to its former glory. Throughout the years the basilica has seen some improvements but also a significant amount of deterioration. During the Crusades a monastery was added and a roof reconstruction project was completed. Over 350 years later in 1837 the church endured an earthquake, which damaged the bell tower. Following the earthquake, the church fell victim to looting and a large quantity of marble was stolen and used to construct buildings in the surrounding area. The wood was rotting and the roof was leaking, up until recently, that is. In 2013 the church would see a much different fate. Enter Piacenti S.p.A., the family-run restoration company from Prato, which is currently undertaking the large-scale, multimillion-dollar restoration project. In 2010 the University of Ferrara coordinated an initial study with the goal of formulating a plan for the church’s restoration. In 2013 the Palestinian government promoted the restoration and assigned the work to Piacenti S.p.A., which is currently working under the supervision of the university. Highly specialized restoration workers were assigned to the project and must use building materials that are faithful to the church’s original construction materials, like the wood for the giant wooden ceiling. The project is more than halfway finished and to date has cost 14 million Euros. Funding for the project has come from 25 different countries including the Vatican, Russia, Turkey, and Morocco. Additional donations have come from private Palestinian investors and 4 banks. However, Piacenti S.p.A. says that it will need another 5 million Euros in order to complete the project. The restoration of the basilica is not only crucial to the building’s survival, but it has also lead to a historical discovery. Workers using thermal imaging cameras had noticed a change in the plaster’s color, so they removed the plaster wall and uncovered a series of mosaic angels that face in the direction of the Nativity.